Aiden came to me wanting a freshening up of his original website but keeping to within a sensible budget. For most web designers this would be classed a standard brochure site project but after talking to Aiden we both realised there was a lot more potential to build something that would work as a useful addition to his business, still keeping to the original budget with a few tweaks here and there. After spotting there had been no on-site SEO work carried out on the original website I realised Aiden was missing out on search engine traffic for some of his core niches, which were weddings and corporate entertainment. Even worse, the keywords originally being targeted had very little available traffic. Using this information I restructured his new website targeting new keywords as well as putting measures in place to catch any traffic that might still be floating around for the old website. Redirects to catch the old traffic and avoid a lot of dead links showing up in Google is something a lot of web designers will miss or not bother to do. Ideally what I aim for when re-building a website is to make the changeover as seamless as possible and not cause any disruption, even going as far as carrying out most site changeovers around midnight. If a web designer has ever left your site with a ‘Coming Soon’ holding page, they need a serious talking to, this is something that is very rarely needed unless you have no site to start with. Anyway, from benchmarking the strength of Aidens original website and selecting realistically achievable targets for the new website the end results have only been positive. Just for the competitive search term ‘wedding singer London’ shown above, Aiden achieved a nice rankings increase on Google (64th to 22nd) and this was achieved without needing to fork out extra for internet marketing. Done right, some established websites can grab a lot of extra free or more importantly targeted traffic with careful planning by the web designer. Saving you a lot of unnecessary extra marketing effort and expense. What’s bringing home the results? Aiden now has goal tracking attached to his contact form, which is then included with a report that is sent to him each month. 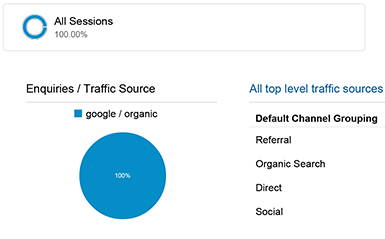 This not only tells Aiden how much traffic the website is receiving, but where from, along with a count up of how many enquiries each channel is responsible for. Without showing too much of Aidens reporting you can see straight away from the small snapshot, all of his enquiries are coming from Google. If you are spending any serious time or money promoting your business online or offline this information is crucial. Why would you keep pumping money into advertising that’s clearly not working? A key area was going to be keeping the site fresh with new information. From the start I knew I would need to cut down the amount of clutter when Aiden logs in to administer his website, remembering his talent is for singing, not IT. 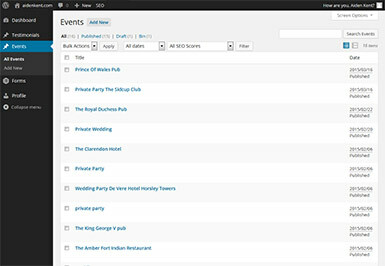 Then, two items that would always need updating are events and testimonials. Now when Aiden logs in to update his site he’s not presented with every option available, most of which he doesn’t need, he can easily get at the options he needs and get back out with the minimum of fuss. It doesn’t end there. With the testimonials there was the opportunity to cut the work needed to put these online to almost nothing. So on the contact form there is also the option now for past clients to add testimonials to the site. They’re fed through the contact form into the site to the same place Aiden would add them manually, ready and waiting for Aiden to approve them, cutting the time he needs to spend updating his site so he can spend more time on his business in the real world. Every website I build (since June 2014) is mobile friendly as standard. This in my opinion should be the way regardless, especially now Google recognises sites that support mobile devices. If you ever wondered what all the fuss is about, go to Aidens website on a laptop or desktop and grab the bottom left of the browser window, now drag the corner of the browser window around to see the content resize and slot itself into the correct position in relation to the screen size. For some businesses this is a nice to have, but what if you’re a locksmith or plumber? Nobody in this day and age is going to fire up a desktop computer while their house fills up with water, or you’re standing locked outside with no access to a computer. A quick word on performance. Tied closely with mobile is performance. 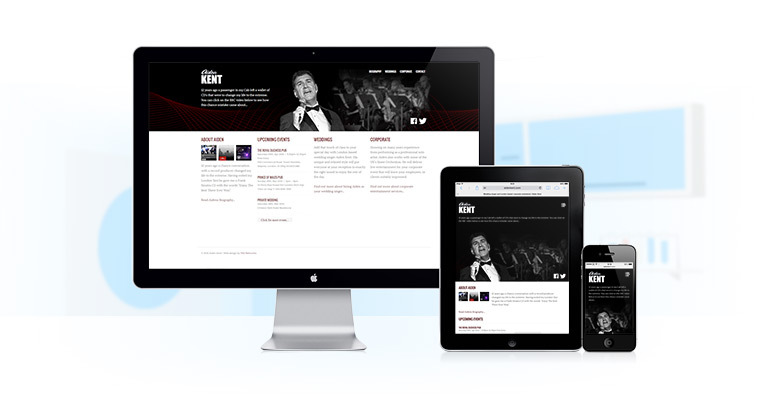 If your site loads slowly (especially on a mobile) who’s going to wait? Even if that visitor is just sitting on a sofa. 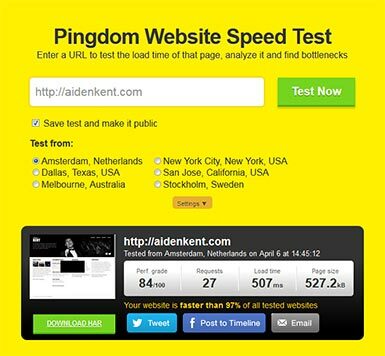 All my sites are as lean as they can possibly be, Aiden’s site loads in about 507 milliseconds to bring this into context Google.co.uk loads in 782 milliseconds. To make this example even more stark Aiden is running his site from a very basic hosting plan. He knows the day he needs to upgrade his server it won’t be to prop up a poorly performing website. For larger more complex websites this can mean a saving of at least £50 – £500 per month on hosting costs possibly a lot more. Aiden really doesn’t need to worry about much when it comes to his website, there’s a full copy backed up and ready to go should the worst ever happen and he knows he’ll always get a prompt response from me if there are any updates needed. In short the website is one small piece of his business that he no longer needs to worry about.